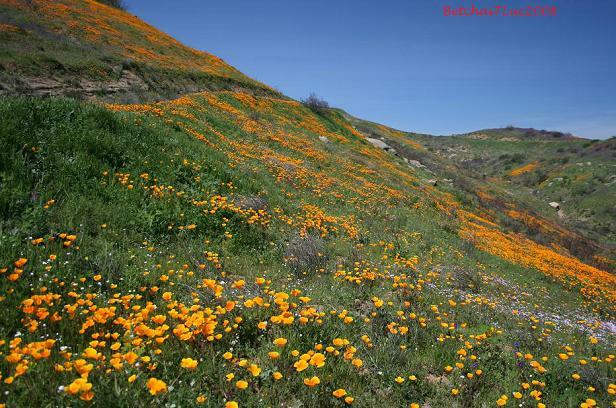 San Diego’s field of California Poppies, at Tooth Rock Trail, Poway. Tooth Rock has many branching trails. There are level trails, and there are some trails that go uphill, but the slopes are more gentle, at least compared to Iron Mountain and the latter part of Woodson Mountain from Lake Poway. These two mountains can be seen from this trail. I am not sure if there is a trail here that connects to Woodson Mountain, since it looks like there is one, but we just did not go far enough in that direction since we went up Tooth Rock peak instead. The trails are wide enough, also for horseback riders. This trail is not as popular as Iron Mountain or Woodson Mountain nearby, for there are very few hikers here. 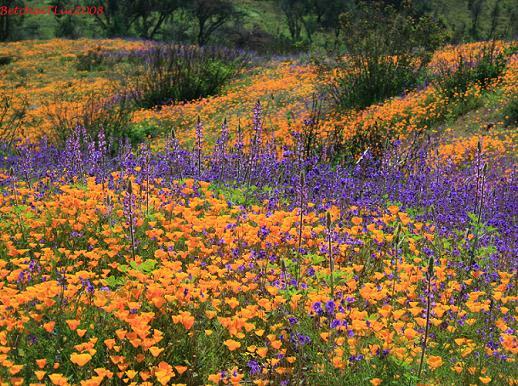 The peacefulness and solitude in the midst of poppies, lupines, phacelias, among others are truly mother nature’s wonderful treat. The very few people I crossed path with in the trail are either the locals with their dogs, and photographers who bring with them large cameras and tripods. The trail here can be short or long. 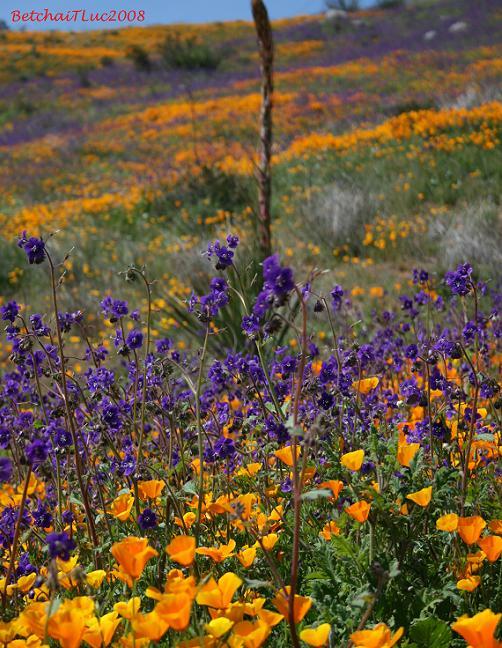 If one is only after the wildflowers, in just less than a mile from the trail head, the exploding colors will treat your eyes right away, and maybe, will take your breath away! 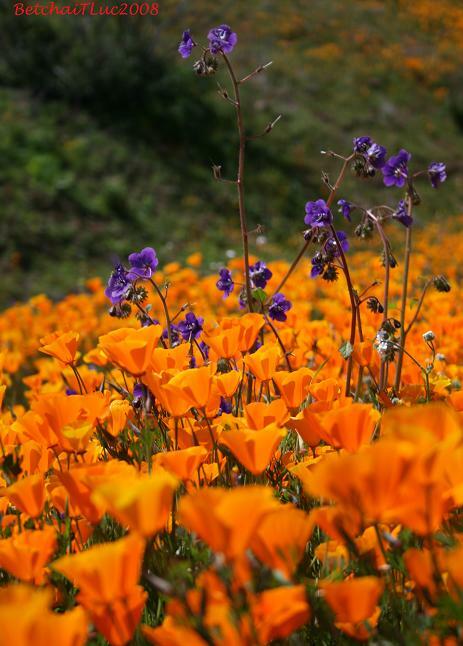 However, I believe that the wildflower display will awe and inspire you to keep on going and moving, enjoying the wildflower field that surrounds your hike. The trail can be flat or uphill, short or long, depending on which one you will take. 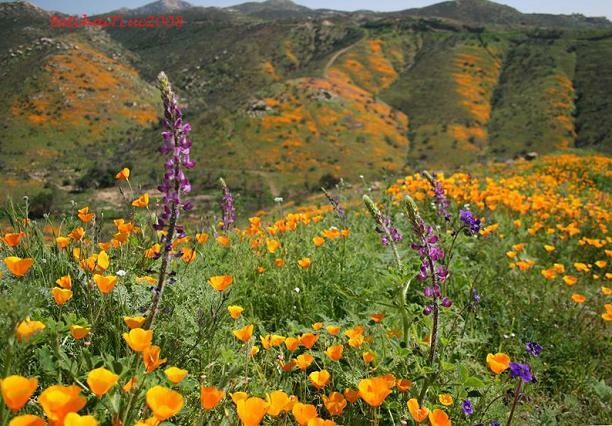 You will be in between hills or in a canyon that are mostly covered with spring colors. 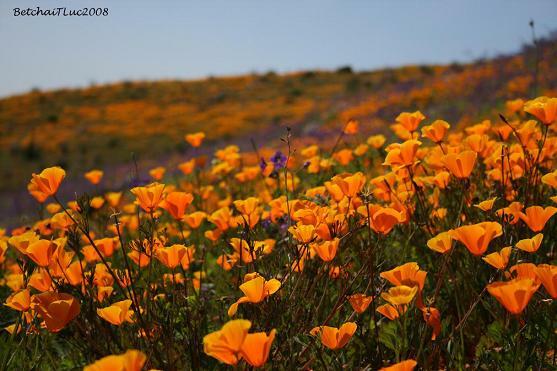 When I moved to San Diego 4 years ago, I was not as paying attention to the beauty around. 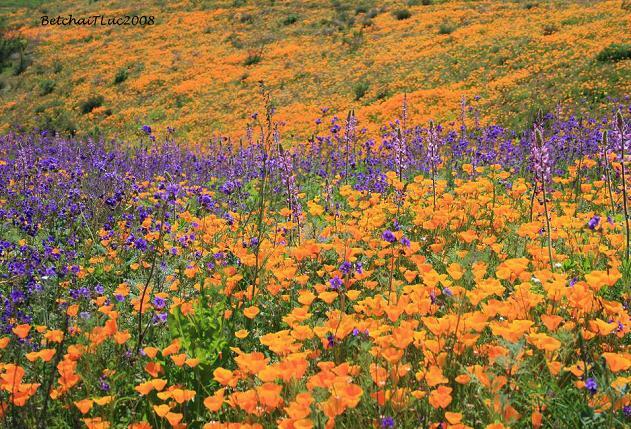 I therefore missed the wonderful wildflower display of 2005. 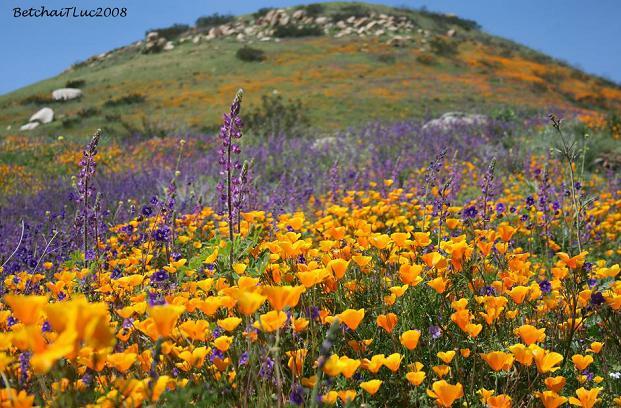 But since hiking has awakened me to our beautiful world in the backroads, every winter, I pray for rain to come 🙂 and always hope for a good wildflower bloom. 4) Can you identify Poway Road at the edge of the opposite cliff? 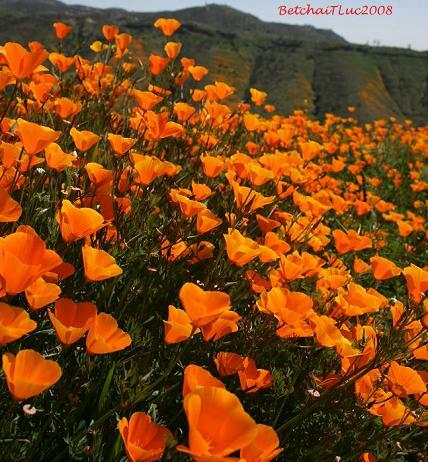 View from near the top of Tooth Rock, with lots of golden poppies. 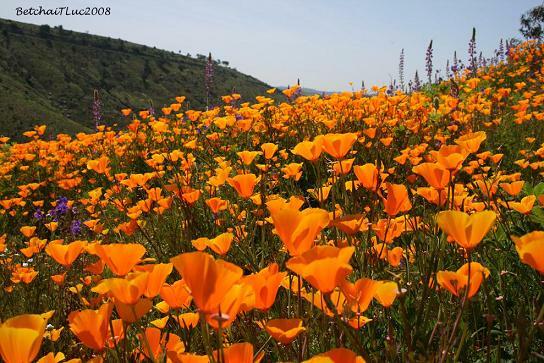 5) Lone yucca, California poppies, phacelias, among others. 6) Nature’s Flower Arrangement that caught my admiring eye. 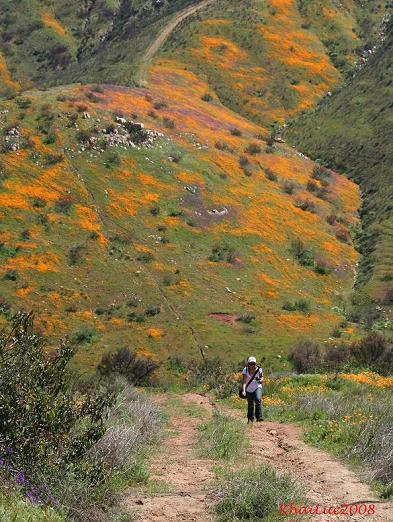 Spring is now here, hit the trails and enjoy the wildflowers while they still last. But remember mother nature needs us to help her to take care of herself.